Josh Ummel not only has the equipment and know-how, he also knows how to put the customer first. When that happens, everything else falls into place. That's what we've found over the years, anyway. He's being working with sound and lighting for over 10 years, and he offers his services for weddings, birthday parties, banquets, live music/concerts and more. 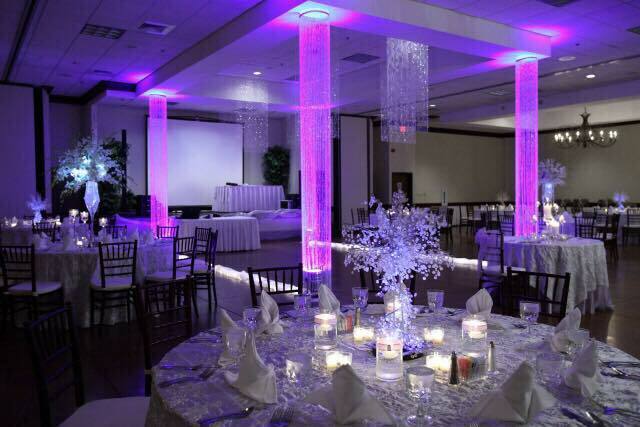 He also does up-lighting, lighted crystal columns (in photo above), and projector rental. For our first review we decided to introduce to you the Mt. Zion Convention Center. 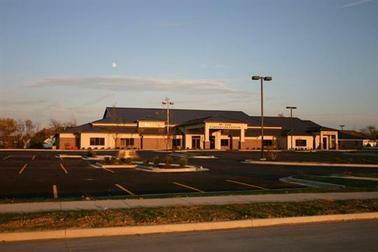 Unless we hear otherwise, this is the newest venue for holding wedding receptions in the area. We actually got to see this place as it was being built and we knew it was going to be big. Big it is. The main three rooms when used together, has a little over 11,000 square feet. Plenty of room for your wedding party to dance, and both sides of the family to get down and party! It has other rooms too, as well as a kitchen, so it’s great for other events such as meetings, expos, you name it. They offer catering from a few different vendors and from my experience, the food has been awesome. The staff are very friendly, and the whole atmosphere is just great. Plenty of space to not feel cramped and that’s a plus. This facility is big enough to fit the wedding needs of Mt. Zion, Decatur, as well as many other surrounding communities. We would highly recommend the Mt. Zion Convention Center in Mt. Zion, Illinois. Jim & Stephanie Wilkerson, your husband and wife team!